In August 1945, the United States dropped atomic bombs on Hiroshima and Nagasaki. The Japanese cities were destroyed and thousands of civilians killed; countless more died of radiation. The nuclear age had dawned. Nuclear weapons have never been used in anger since, but the world has shuddered at the ugly mushroom shape of test blasts and once or twice has teetered on the edge of nuclear catastrophe. With the end of the Cold War, humans have stepped back from the brink but the United States, Britain, the former Soviet Union, France and China had stockpiled nuclear weapons and more countries are becoming capable of producing nuclear weapons. 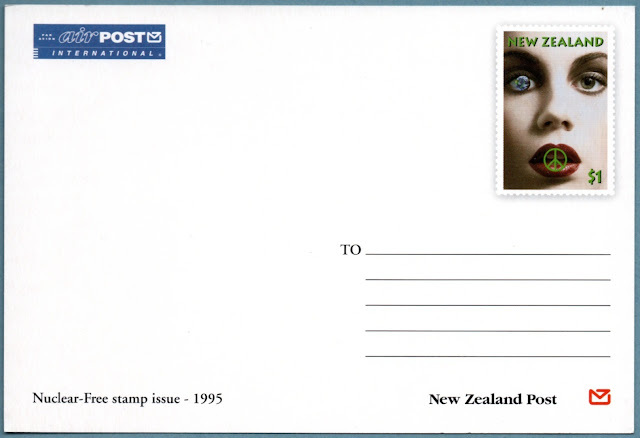 New Zealand Post issued this special stamp featuring the international peace symbol to communicate New Zealand's opposition to nuclear weapons and nuclear testing and its hope that the world will one day be nuclear-free. I personally do not like the look of this stamp but I think it is that appearance that makes the stamp standout. 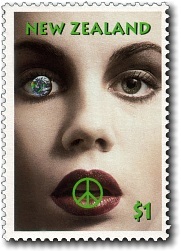 Post Card with the Nuclear-Free stamp. Using cards like this was a very effective way of getting the message out to many people. 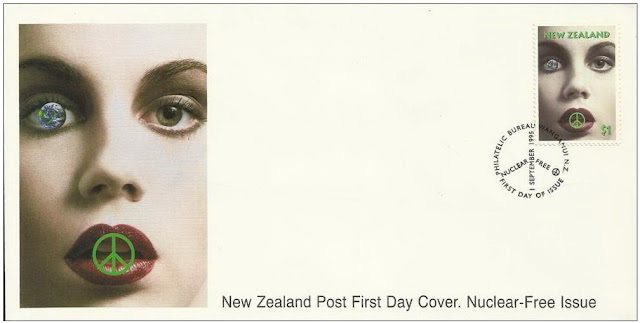 Stamps and first-day cover designed by: Colenso Communications Limited, Wellington, New Zealand. Printer and process: Southern Colour Print, Dunedin, New Zealand, by lithography. Stamp size and format: 28mm x 40mm (vertical). Number of stamps per sheet: 100.